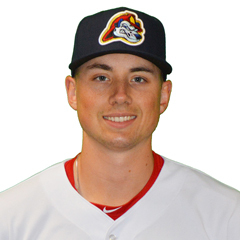 Player of the Day Zach Prendergast’s outstanding start led Peoria to a Midwest League Championship series-evening victory on Thursday. Results from the game played Thursday, September 13th. After splitting the first two games of their best-of-five Pacific Coast League Championship Series at Fresno, the Redbirds (1-1) head back to AutoZone Park where they will host the series’ balance. Zach Prendergast struck out seven in 6 2/3 scoreless innings as Peoria edged Bowling Green, 2-1, evening the best-of-five finals series at one game apiece with three to play. Player of the Day Prendergast tossed a dominating effort, retiring his first 11 Hot Rods (1-1) (TB) before issuing his only free pass. The Pennsylvania native gave up just two hits, a lead-off double in the fifth and single to open the seventh, and threw 64 of his 97 pitches for strikes. The right-hander has now fanned 18 in 11 2/3 postseason frames covering two starts and is yet to yield an earned tally. An errant pickoff attempt by Patrick Dayton (W, 1-0) put Prendergast’s final runner within 90 feet of home plate but a swinging K ended that threat. Peoria began the home half of the inning with consecutive singles by Nick Dunn, Nolan Gorman and Rayder Ascanio with Ascanio’s liner to right driving in Dunn. Gorman scored what proved to be the winning run when Nick Plummer grounded into a 4-3 double play. But the Chiefs’ 2-0 lead was immediately halved after Dayton gave up back-to-back singles to kick off the eighth, an event leading to the lefty’s departure. Kodi Whitley jammed the sacks full on a bunt single to his first batter, setting up a sac fly. Whitley (S, 1) recorded another five outs but not before a walk and single put the potential tying and go-ahead scores on base in the ninth. The Chiefs generated eight hits, led by Yariel Gonzalez who went 3-for-4 with a double out of the two hole. Lead-off batter Justin Toerner and Luken Baker, the number three batter, each had a hit as well.